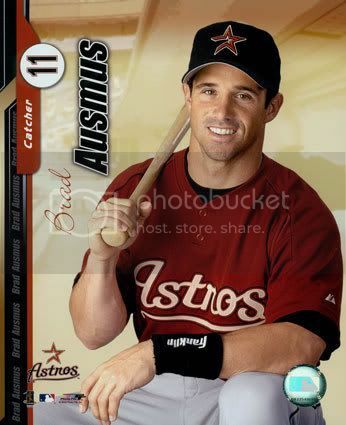 One of the big heroes of that ’05 Astros team was catcher Brad Ausmus, along with hometown favorites like pitchers Andy Pettitte and “The Rocket”- Roger Clemens. (Mike had just completed a TV interview with “The Rocket” at his Memorial home in Houston earlier that spring, so it was great to see Clemens lead the Astros to some real glory.) But history was not so kind to our hometown team: the Astros would go on to be blanked in their only World Series appearance as they were swept 4-0 by the Chicago White Sox. So, what do you do when you’ve just lost the World Series? You shrug it off and go party with The Lost Boys! The Lost Boys launched 80s Flashback Thursdays at Pub Fiction in the summer of 2005 to blockbuster lines around Midtown! And that’s exactly what All-Star catcher Brad Ausmus did the very next night back home in Houston. “The Brad” came to our show at Pub Fiction for our regular 80s Flashback Thursday and actually had a blast with us! MLB All-star catcher Brad Ausmus poses with singer Renee Edd after a sold out Lost Boys show! A lot has changed over the past 10 years: Brad Ausmus is now a major league manager with the Detroit Tigers, Pub Fiction no longer hosts a weekly 80s Flashback, and the Astros are in an entirely new league: the American League. But some things never change– and The Lost Boys still deliver the best 80s experience in Houston, bar none!